Not everything that looks like an impact is an impact. Forces ranging from sudden volcanism to seasonally swelling ice, and from the slow movement of heaving salt to gradual erosion by wind and water can all produce crater-like structures. Following up on the ones listed below, using wikipedia and then google or other searches in order to understand how, where, and why they form, may allow the reader to discern what may or may not be dianostic criteria for each of these forms, both at ground level and from an aerial view. Each is different from the other. Eroded sedimentary layers, for instance, typically form circles around hills, not bowls, and can be distinguished by the visible continuation of sedimentary layers on surrounding rises. On the ground, the rock distinctions themselves can be seen. 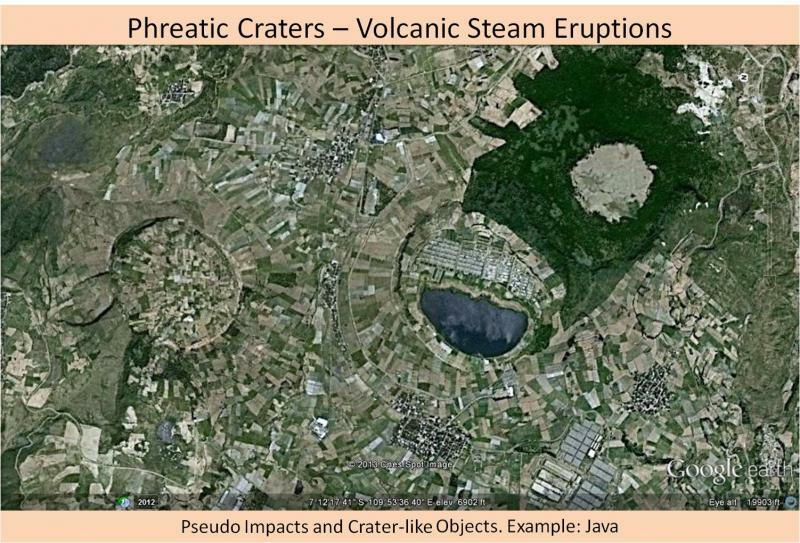 Phreatic (steam) eruptions are probably the most ridiculously confusing of all of these forms, since they can occur in non-igneous rocks, produce breccias, raised rims, and simple explosive bowls surrounded by ejecta. They do not, however, produce the shock results, at a grain scale, that can be seen in materials metamorphosed under and around a hypervelocity impact site. The appearance of individual examples of each of the structures below can vary significantly, so be sure to follow up with searches if you are interested. Many of these can be identified by considering their context. Volcanic craters are found, for instance, in volcanic regions. Others, while not necessarily intuitive, yield to basic searches. 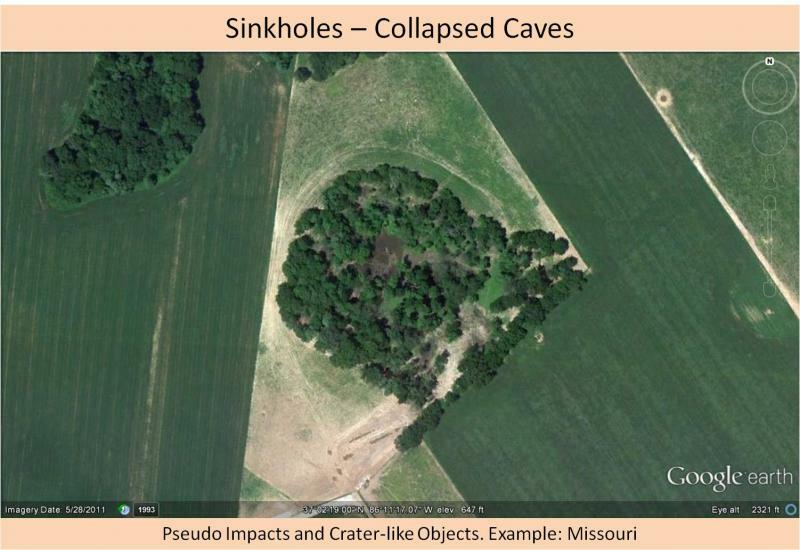 The basic, descriptive search terms 'hole in the ground Missouri' will quickly link you to a number of starting points to understanding sinkholes. 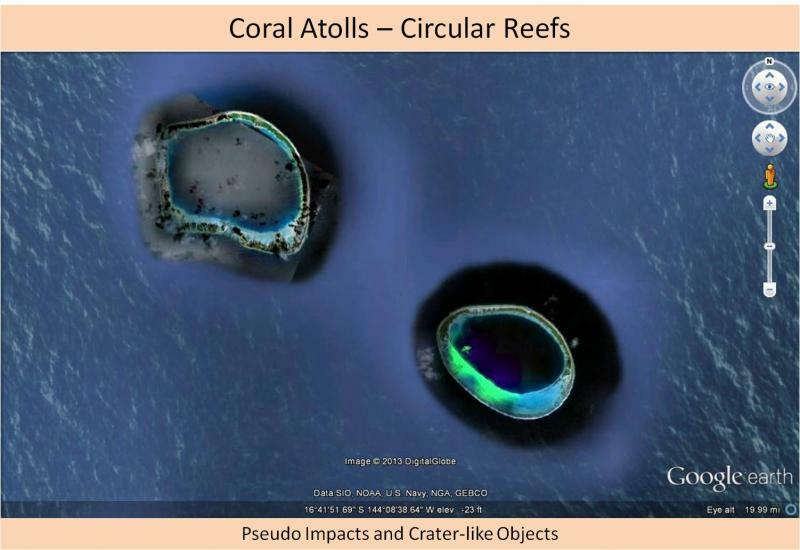 Google Earth is a great tool for learning about these objects. In fact, it may be the greatest tool yet invented for the task. The GPS coordinates are listed in the images, and visiting the areas in which the shown objects are found is a great way to get started in understanding what other, similar objects may look like. 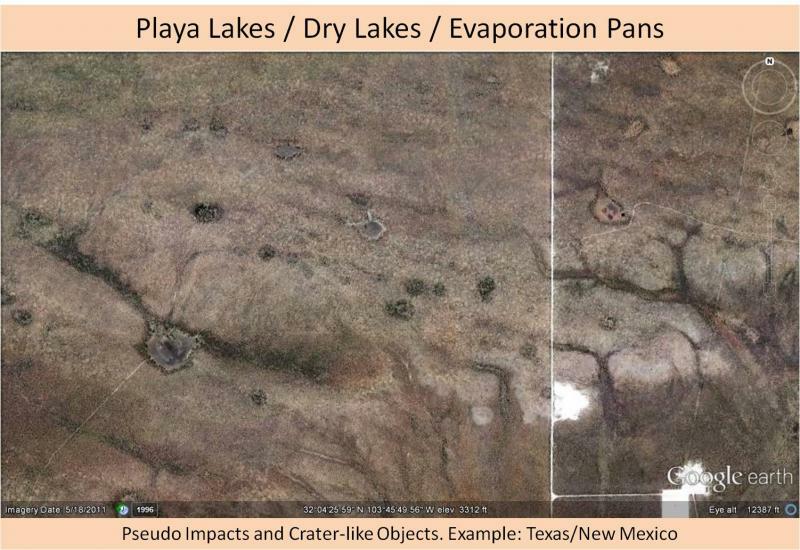 Volcanic craters can mimic both simple and complex craters. A simple eruptive crater may have a raised rim, surrounding breccia or clastic conglomerate, and melted rocks. In some cases, where slow eruption resumed after a blow-out event, a volcanic crater or caldea may even contain what appears to be a raised central peak, thought this will always be composed of igneous rock. A volcanic crater is most readily distinguished, in aerial or map view, by considering its context. 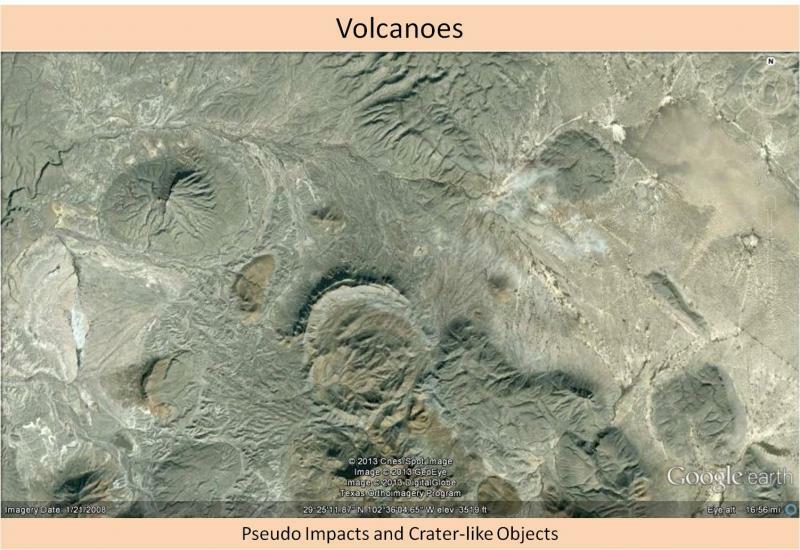 A volcanic crater will often occur in context with other volcanic features, often in a regional cluster. It will also often be surrounded by an overall rise in the land surface that far exceeds the volume of material ejected from the actual crater bowl. 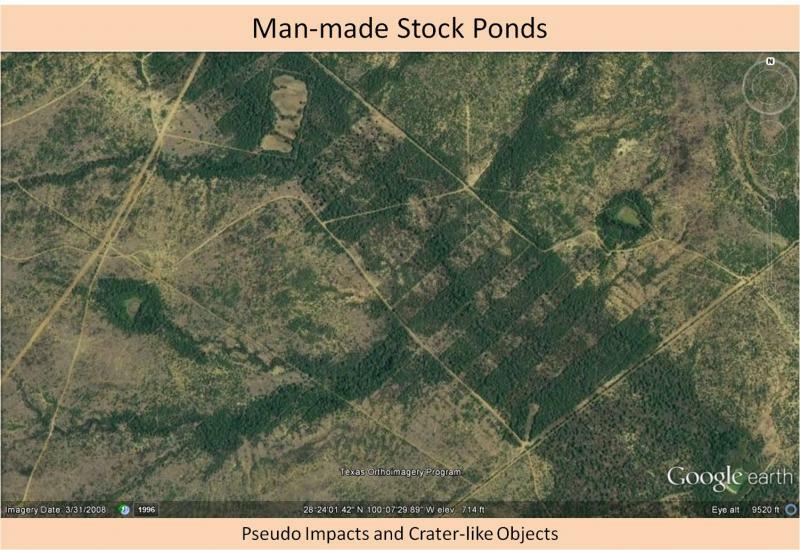 Because they can be roughly circular, may have a raised rim, and may pre-date the memory of people currently living in an area, some older stock ponds can make convincing pseudo-impact sites. It is conceivable that several small craters that have filled with water are among these, hiding in plain view. To distinguish a stock pond, consider the setting and the details of the rim. They will typically be constructed in a topographical low, cross-cutting a drainage path, and with the rim raised highest ont he downhill side, so that they can collect and hold rain water. In keeping with their function, they will also typically be constructed in an area where livestock grazes or has grazed in the past. 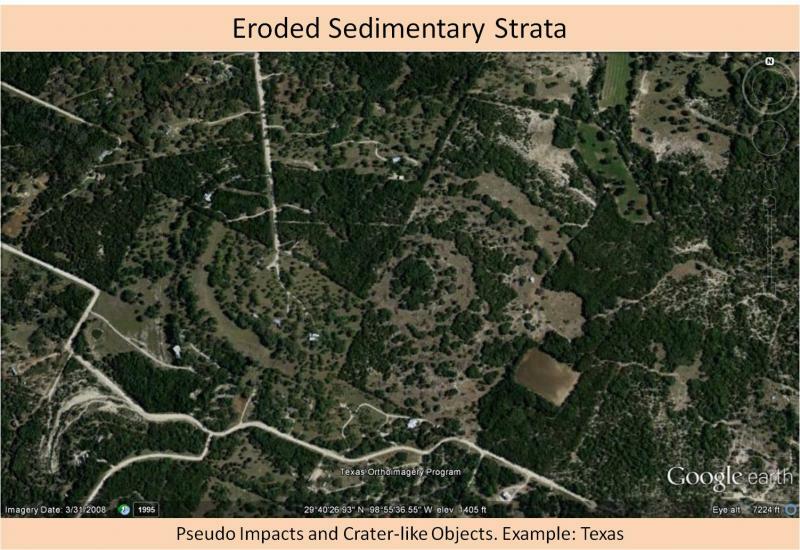 Sinkholes do not have a raised rim, are not associated with ejecta or breccia, and typically occur in karst geologic regions, meaning regions in which topography is influenced by underlying cave systems. 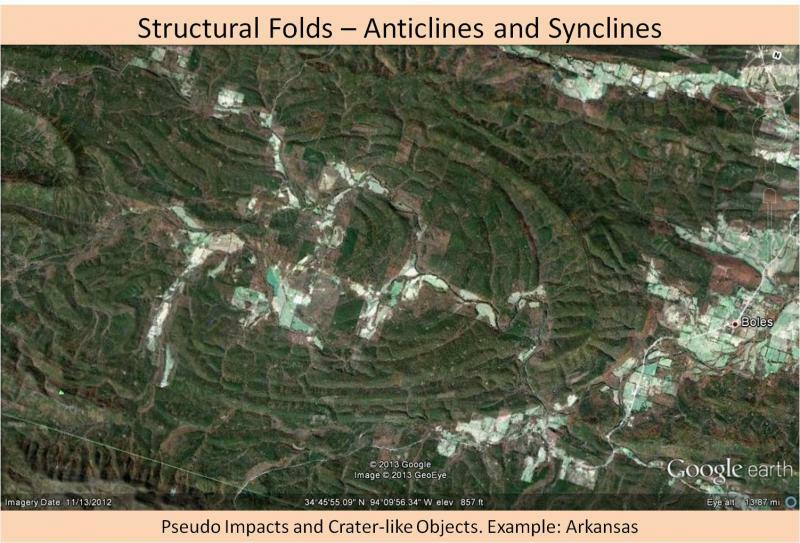 Sinkholes cluster regionally. where there is one, there are typically many scattered across the landscape. They are typically 10s to 100s of meters in diameter. 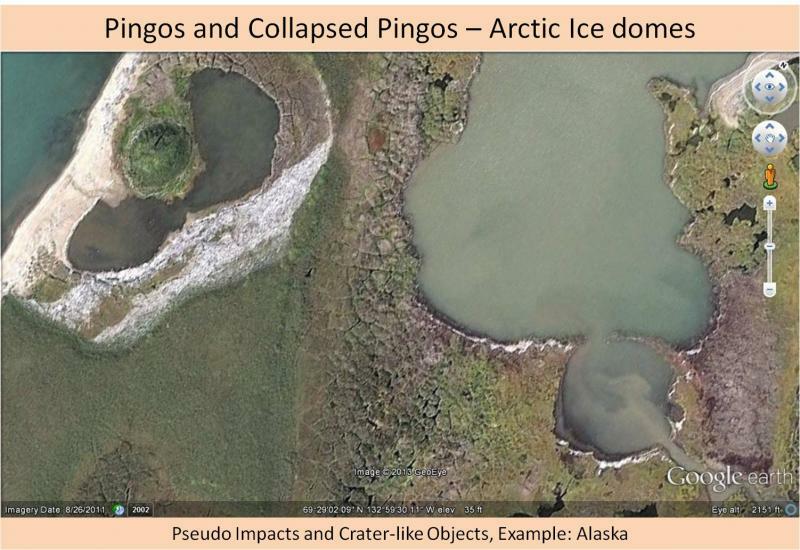 In some cases, collapsed pingos can be very much like small impact craters in overall morphology - circular bowls with a raised rim. Considertation of context and details, however, should clearly reveal their origin. They are typically less than 100 meters across, only occur in extremely cold, wet regions, are not associated with breccia or ejecta, are generally expressed in soil rather than rock, occur as regional clusters, and are often quie famous in the regions in which they occur. While circular, the exposed shelves of rock that encircle pinacled hilltops in sedimentary regions are typically easily distinguished with some consideration of context and shape. They occur as raised remnants or hills in sedimentary rock, typically have no surrounding annular basin, are not associated with breccia, and have no raised rim. River meanders may have a slight raised rim, associated with flood deposited gravel and debris, and can be very well rounded, but they are always found on relatively flat land, on flood planes, along water courses. 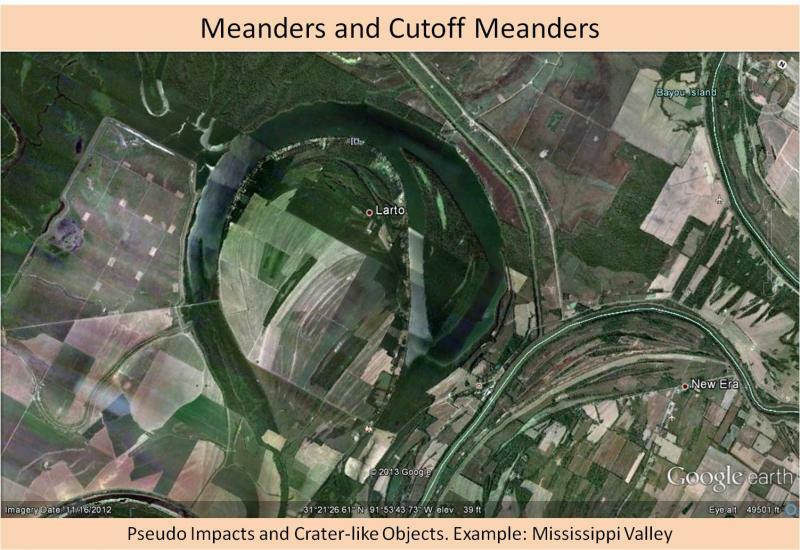 While a river may have migrated many miles from where it carved a cutoff meander, considering the structure in context will generally reveal its origin. Meandes do not dwell alone. They are remnants of meandering rivers, and are thus associated with the remnants of many other loops and curves. Coral attols are marine structures. They are typically nearly round, but seldom perfectly so. They are often present in regional clusters and are often famous in the regions in which they are found. 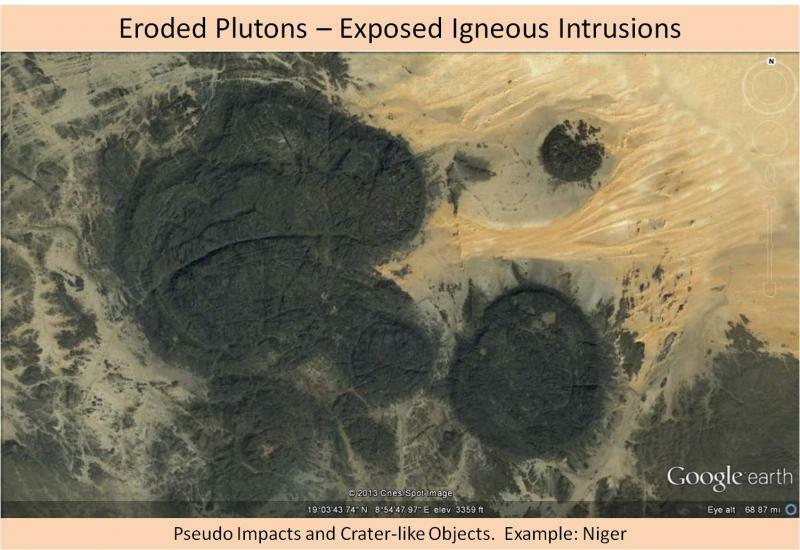 While these can be confusing from an aerial perspective, they bear little in common with impact craters when considered from a strucutral or compositional standpoint. 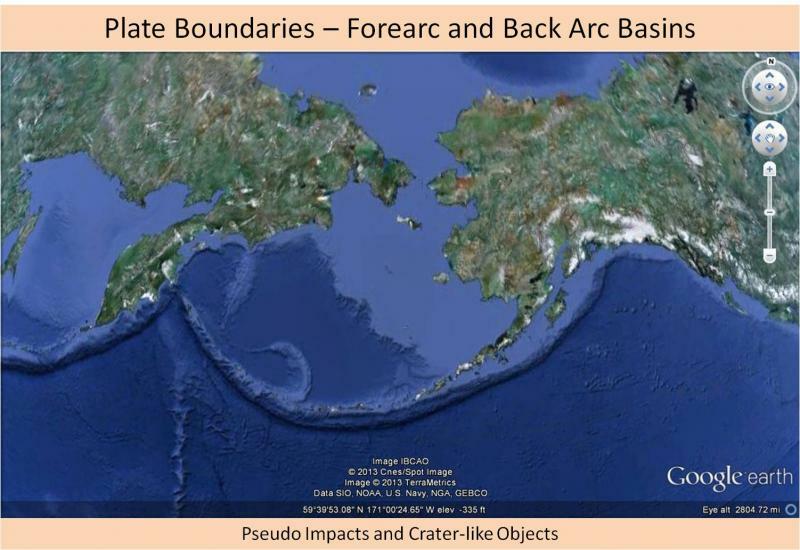 Real impact craters erode quickly in marine environments. Calderas are among the most crater-like structures on the planet. They may have a clear raised rim, an interior annular or bowl-shaped basin, surrounding ejecta, and are associated with large quantities of breccia, clastic conglomerate, and melted rock. In cases where volcanism has resumed after an explosive event, they may even contain a raised center, similar to a central rebound peak. Several things dramtically distinguish calderas from large impact craters, however, upon close consideration. 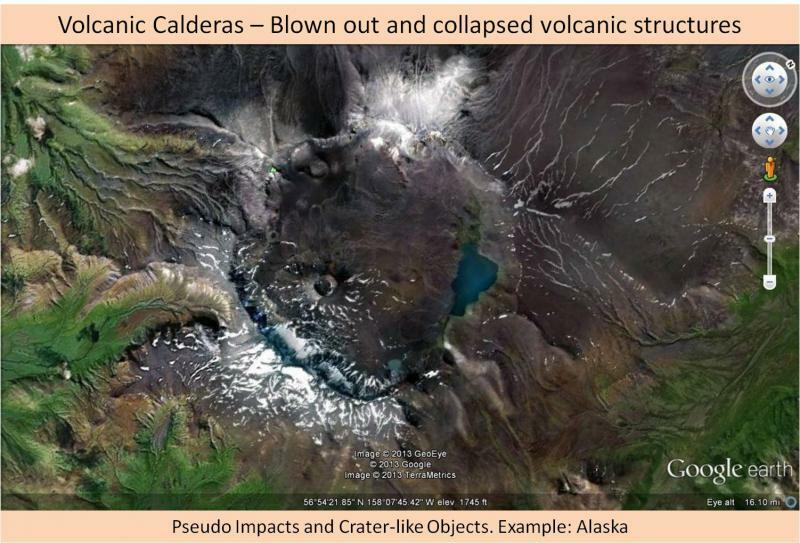 Calders are often associated with a strong, surrounding regional rise in the landscape and are generally found in mountainous, volcanic regions, and are often associated with other nearby volcanic features. They can range in size from less than a km to several tens of km in diameter. They may have small eruptive craters or vents on their flanks or nearby, may have distinguishable ancient lava flows originating from their flanks, and are typically associated with large quiantities of emplaced igneous rocks. 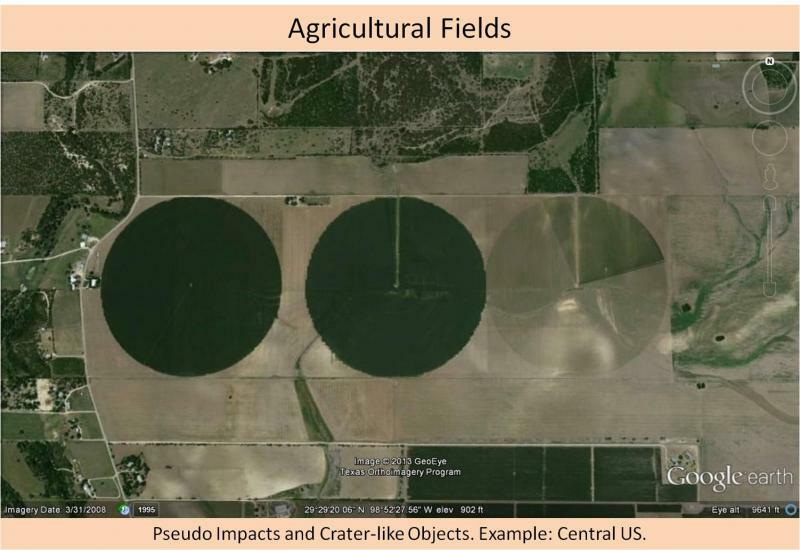 While they are noticably circular, any reasonable degree of consideration should allow a person considering relict agricultural fields to distinguish them from impact features. Being aware of them as a teaser to the eye, however, may save some time for someone considering aerial or satallite data. They have no raised rim, ejecta, breccia, basin... and so on.